Not everyone has the time or budget to make regular trips to the physiotherapist. Can modern technology help you get the same quality treatments in the comfort of your own home? 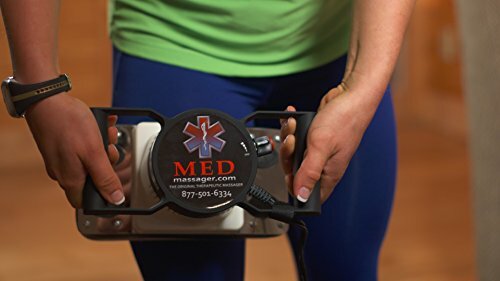 One company that claims to provide this service is the MedMassager brand. With quite a few products on the market and with many professionals also using the products consumers often pick this whether it’s to relax or treat injuries. Perhaps our Med Massager reviews can help you see if it’s what you need for treating your body too. 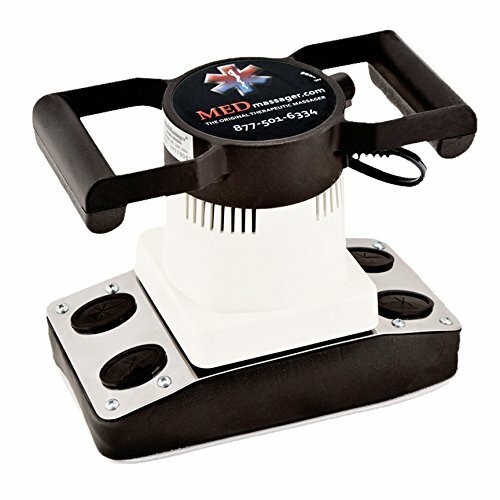 A MedMassager body massager can be used for a relaxing massage or to treat stiff and injured areas of the body. It’s an electric device that vibrates. 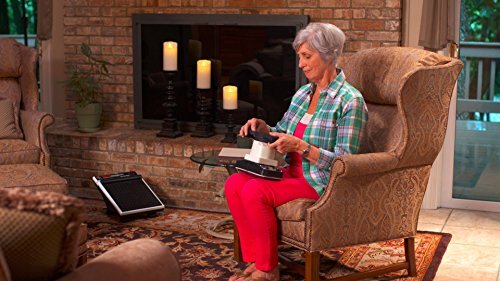 You place it on the area you need to treat or rest the massager on the area to be treated to experience the vibrations. While anyone can purchase these without getting a prescription you’ll also find this in some medical professionals’ consulting rooms. The devices are powerful enough to provide high end treatment. 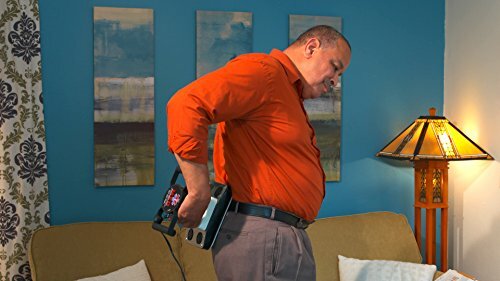 How Does a MedMassager Work? It has different settings so you can customize the experience to your needs or personal preferences. Along with the weight and pressure you apply these oscillations provide you with a massage. It’s strong enough to even work when you wear clothing or shoes. It’s designed so you can use it when alone or when asking someone to help you. 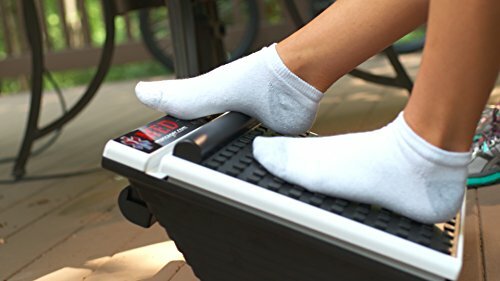 This is the brand’s foot massager and it has a large foot pad as well as an arch bar. The pressure point targeting surface helps you deliver impactful treatments to the areas of your feet that are most painful or swollen. 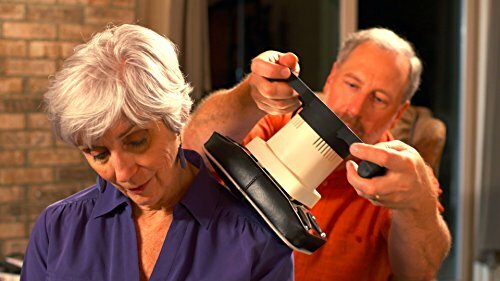 If you need a deep massage but you’re not able to visit the doctor this is probably your best option since it’s the most powerful massager you can purchase without a license. It works on various problems such as tension and swelling so it’s an investment in general muscle health. Four are used to keep the item in place. They’re also rounded to allow the unit to rock back and forth. This adds to the quality of the treatment as you can stretch while you treat your legs. Two legs on the front are used when you tilt it forward so you can massage your calves. You simply tip it onto the front feet and then it’s at a practical angle to rest your leg on top. It can reach both your calf and Achilles area. 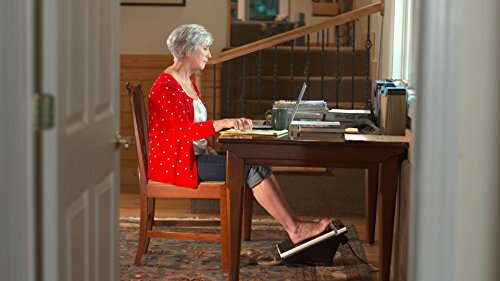 The pad’s large design makes it practical for most people’s foot sizes. An improvement to the brand will hopefully consider is to add heat features as this will enhance treatments. The design is very practical: You get a kit to use when you want to place it on hardwood floors or slippery tiles so you can use it almost anywhere without it slipping. One unfortunate feature of this electric foot massager is that it makes quite a loud noise. Consider the warranty options before finalizing a purchase though. You do get a 1 year warranty but a lifetime replacement option is available as well which you can order from the manufacturer. If you know you’ll be using this a lot this additional expense can be worth it. Why go to the doctor if you can get a proper massage at home, right? That’s the motivation behind this machine and it fares pretty well in giving consumers access to quality massages. It has sturdy handles to grip it and a massage surface through which oscillations help increase blood flow to the area you’re treating. What’s great about the design is the multiple ways you can use it. You can grip it yourself or ask someone to massage you. An alternative is to wedge it between you and a chair back or headboard. The structure is designed for this and sturdy enough that you can lean against it & still get an exceptional massage. You can even position your leg on top of it without the weight damaging the machine. The design and sturdiness mean you can position it to treat almost any part of your body. It’s not super light but 6.7lb is manageable for most people. It’s ergonomically designed too so it doesn’t put too much strain on your hands. You can adjust the speed to exactly what you need which makes for a customized treatment. It doesn’t produce heat. This would have been a great added feature. However the oscillations tend to generate heat in the area you treat which will also benefit the healing process. When the cells heat up it can enhance some chemical processes in the body. Note that you may experience the machine’s strength deteriorate over time as components wear out. It’s worth it to consider the lifetime warranty option the brand offers. This is the brand’s older model but it’s still a favorite for many users. It’s a chiropractic body massager and since professionals still use it it’s still a viable option for consumers. So what’s different about it? First, it’s more affordable than some other MedMassager machines so if you’re shopping on a budget this makes sense. It’s even better priced than some other brands’ similar products but you get the MedMassager standard in terms of quality and warranty. It still delivers exceptional massages but you do have to settle for only have two settings instead of multiple ones. This obviously makes treatments less customized than some other massagers on the market. It’s also a bit heavier but 7.5lb is still a manageable weight for most people. The design allows you to prop it up so you can lean against it to treat hard to reach places. However users often find it’s difficult to treat the back area. For this you may need someone’s help. It’s powered by a long cord and AC power, not batteries so you’ll need to sit near a power outlet during each treatment. The cord the brand provides is comfortably long so you normally don’t need an extension. 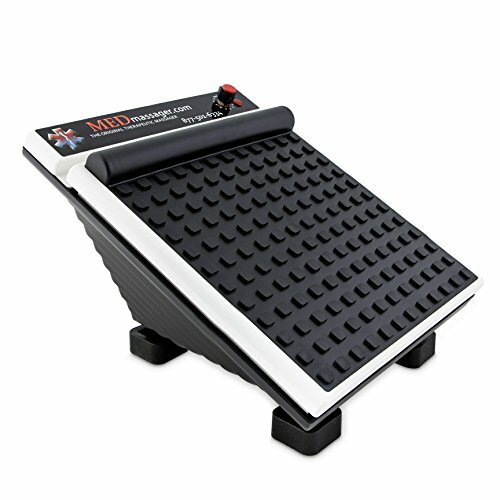 As these Med Massager reviews show there is impressive, professional strength equipment on the market which is worth the investment. This brand has many supporters and we can see why as the products are sturdy & versatile. The oscillating movements are beneficial to treat many muscle problems. Even if a heat aspect would have been even better, these machines can give you exceptional treatment. 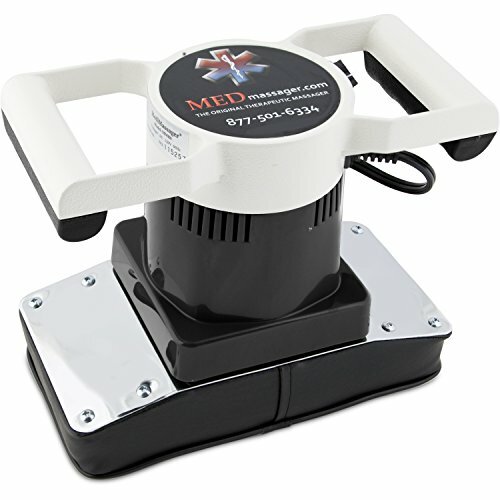 It’s wise to invest in products that can give customized treatments so the MedMassager MMB04B is probably your best option. You can treat any part of your body and with so many settings & such high rpms you may never have to visit your physiotherapist again.